Through two sessions of efforts, the Zhengzhou Photography Biennial Exhibition has formed a unique cultural pattern and artistic orientation. It displays the cultural self-confidence of local brands with an open attitude, and builds an international culture and art communication platform for the construction of Zhengzhou as a national center city. 2020 Zhengzhou Photography Biennial Exhibition does not distinguish between image categories. It will adopt two types of curator recommendation and collection of works. The theme of this biennial exhibition emphasizes internationalism, artistry and technicality. This international photography event welcomes contemporary and experimental artists and their works that transcend traditional themes. 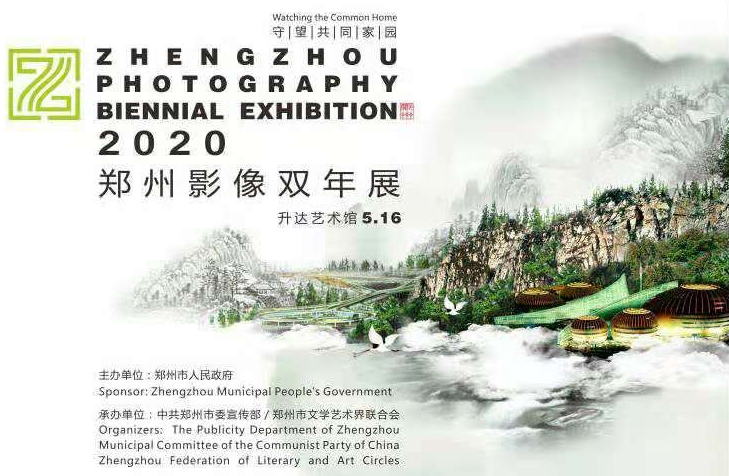 The theme of 2020 Zhengzhou Photography Biennial Exhibition is “Watching the Common Home”, which is a continuation of the theme of the previous two sessions exhibitions (“Set Off from East” and “Walking with the New Era”, which are the theme of 2016 and 2018 China International Photographic Art Festival・Zhengzhou Photography Biennial Exhibition which co-sponsored by Zhengzhou Municipal People’s Government and China Photographers Association) and an extension of the “A Community of Shared Future for Mankind”. At present, human beings face global problems such as economic development and environmental protection, resource development and green ecology. Photography as a visual art should not be simply record and illustrate these problems, but should be transformed and promoted into spiritual issues through visual language. In this context, "Homeland" is not only the place where we live, but is also the spiritual home created by human civilization and the harbor where the hearts meet one another. In the vision of globalization, we sincerely hope that through the 2020 Zhengzhou Photography Biennial Exhibition, we will surpass the constraints of regional culture, using image construct a harmony in a diverse human visual art community, which to watch our common home. c. Both solo exhibitions and group exhibitions are agreed to adjust exhibition and the plan by the organizing committee. g. The activities ideas for the exhibition. The 4th Civilization Zhengzhou Photography Exhibition aims to comprehensively demonstrate the development achievements of all aspects of Zhengzhou's spiritual civilization construction, highlight the achievements of Zhengzhou City in deepening the creation of a national civilized city, reflecting Zhengzhou's long history and culture, human landscape, folk customs, beautiful scenery and cultural tourism, enriching spiritual and cultural life of the people and promoting the construction of the Zhengzhou National Center City. The 4th Civilization Zhengzhou Photography Exhibition is a reserved section of the Zhengzhou Photography Biennial Exhibition. The exhibition will focus on the Zhengzhou Airport Economy Zone, shooting in different stages and regions. In recent years, the Zhengzhou Airport Economy Zone has followed the beat of the times, set foot on the open drums, and sailed with the “Four Silk Roads” sail, opened a new way of opening up to the outside world based on the Central Plains, serving the central region and connecting the world. Starting from the "air, land, online, and maritime Silk Road", centering on aviation economy and the aviation metropolitan area. To use the lens to record the development of the Zhengzhou Airport Economy Zone, and catch the world’s eyes on the "international, attractive, opportunity, happy" Airport Economy Zone. a. Not limits are set on participants’ age, nationality and shooting time. b. The 60 pieces are selected in camera group, which are required to be shoot by camera, mainly single photo, group photos no more than 12 photos. Each piece of the exhibition works will be paid 1,000 yuan (all remuneration withholding personal income tax). c. The 30 pieces are selected in mobile phone group, which are shot by the rear camera of the mobile phone. mainly single photo, group photos no more than 6; each piece of the exhibition works will be paid 500 yuan. d. The 10 pieces are selected in short videos group, less than 15 seconds in length; each piece of the exhibition works will be paid 500 yuan. e. Works are not limited to art categories. f. The Civilization Zhengzhou Photography Exhibition specially set up an image collection support project: The Zhengzhou Photography Biennial Exhibition Jury will select 3 collection works from the exhibition works, paying each artists RMB 20,000 for the permanent collection of works, and the payment will be withheld personal income tax. The collected works will no longer pay the additional fees. Starting from 2020 Zhengzhou Photography Biennial Exhibition, the “The Collection and Recommendation Project of Zhengzhou Photography Biennial Exhibition” was launched worldwide. To enhance international status of Zhengzhou in the image art collection, Zhengzhou Photography Biennial Exhibition will promote an image charity collection program in the central region. The collection and recommendation funds of Zhengzhou Photography Biennial Exhibition will be 500,000 RMB for each time, of which 200,000 RMB will be used to collect and promote the two artists and their works selected by the jury of Zhengzhou Photography Biennial Exhibition. d. Selection and announcement: On May 15, 2020, the jury of Zhengzhou Photography Biennial Exhibition will publicly evaluate the participants, and the list of artists selected for the collection and recommendation project will be announced in the opening ceremony of Zhengzhou Photography Biennial Exhibition. a. Submission works are JPG format, the camera works are not less than 5M, distinguishability is 300dpi; the mobile phone works require the original picture; the format of video work is MP4 and other formats. b. The Zhengzhou Photography Biennial Exhibition does not accept works and award-winning works that have already been presented in major domestic exhibitions in recent years. The participants must guarantee the originality of their works. The works involve the copyright, reputation and portrait rights and others, the participants or organization liable for any dispute. c. All works are required to have a text description (within 200 words), no text description will not be received. The text description includes the content introduction of works, the shooting venue and time of the works, and the summary of the meanings, etc..
d. The Zhengzhou Photography Biennial Exhibition does not have exhibition fee and does not refund works, all works printed and mounted uniform by Zhengzhou Photography Biennial Exhibition organizing committee. e. The works of Civilization Zhengzhou Photography Exhibition must be taken from Zhengzhou City (including the counties and cities under its jurisdiction) and specify the specific shooting location. For works that that cause doubts about the location, the contributor should go to the shooting location with the lawyer appointed by the organizer. If the work is proved to have been shot within the specified geographical area, the relevant lawyers’ fees and travel expenses will be borne by the organizer. If it is impossible to determine that the works has been shot within the designated geographical area, the relevant lawyers’ fees and travel expenses will be borne by the contributor. if the contributor fails to cooperate with the investigation will be disqualified. f. The Civilization Zhengzhou Photography Exhibition implements the publicity system for the appraisal and selection results. The works to be exhibited will be publicized on the official website of the exhibition for 7 days, and will be subject to social supervision during this period. After the expiration of the publicity period, the selected works will be exhibited at the 2020 Zhengzhou Photography Biennial Exhibition. g. The Civilization Zhengzhou Photography Exhibition prohibits the contributions of the judges and their close relatives. Contributions by such persons will be disqualified. h. If the participants submitted their works and agreed for them to be used in media promotion and exhibition during the publicity period and exhibition period, no remuneration will be paid. l. The organizing committee reserves the right or final interpretation on this notice and all matters in relation to the exhibition. B. Submission folder naming format: " works title+ photographer name + photographer contact information"
C. Please pay attention to the official WeChat “Shengda Art Gallery” or official website (www.cipafe.com) download registration form and fill in the form carefully. Errors in information or file name will result in disqualification. B. Mailing Address: No.113 Chengdong Road, Jinshui District, Zhengzhou, China.